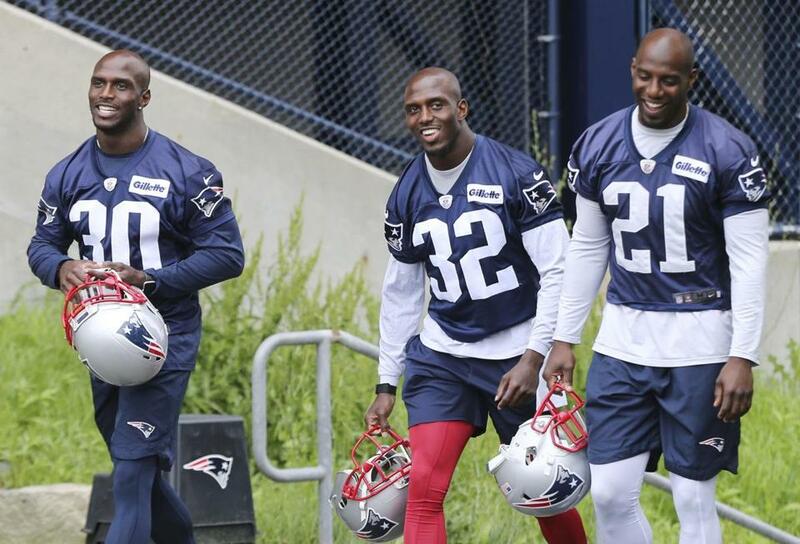 Patriots defensive backs Jason McCourty, Devin McCourty, and Duron Harmon walk to a minicamp practice on June 6 in Foxborough. “Do Your Job” has long been associated with the New England Patriots as a call for teammates to deliver their best effort on the playing field. Now the phrase takes on new and broader meaning, as three Patriot players assume the job of questioning candidates who are running for Suffolk County district attorney. The players — special teams captain Matthew Slater, safety and cocaptain Devin McCourty and his twin brother, cornerback Jason McCourty — are scheduled to moderate a June 19 event at the Lilla G. Frederick Pilot Middle School from 6:30 to 8:30 p.m. in Dorchester. The overall goal is admirable: to address social justice issues beyond the symbolism of taking a knee during the national anthem. In this case, it will also bring much-needed extra attention to an important local race. This contest attracted more than the usual interest after District Attorney Daniel F. Conley announced in February he would not seek reelection, after 16 years in office. Five Democrats and an independent are running to replace him. At a recent forum sponsored by the American Civil Liberties Union of Massachusetts, several hundred people packed into Hibernian Hall in Roxbury to hear a discussion of criminal justice reform measures, from incarceration rates to mandatory minimum sentences to the bail system. 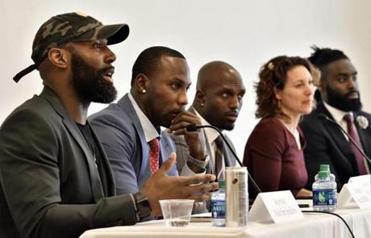 The June 19 forum is the latest in the “Launching Justice: Conversations with District Attorney Candidates” series hosted by the NFL Players Coalition across the country. The Players Coalition is an independent organization that works with professional athletes, coaches, and owners to improve social justice and racial equality. According to a press release, it is focused on police and community relations, criminal justice reform, education, and economic advancement. The Patriots have already been active on the criminal justice playing field. Last February, Devin McCourty; Jonathan Kraft, president of the Kraft Group and the New England Patriots; and Robert Kraft, chairman and CEO of the Kraft Group joined in writing an op-ed for the Globe in which they expressed support for juvenile justice reform legislation that was then pending on Beacon Hill. McCourty also lobbied on Beacon Hill for the proposal, which was ultimately included in a sweeping criminal justice reform package that became law. The Patriots safety is spending the days of his offseason meeting with politicians and speaking on panels. Taking a knee has turned out to be controversial for the NFL. But there should be no quarreling over the merits of activism that encourages attendance at a political debate. These athletes are demonstrating how to be good and informed citizens.